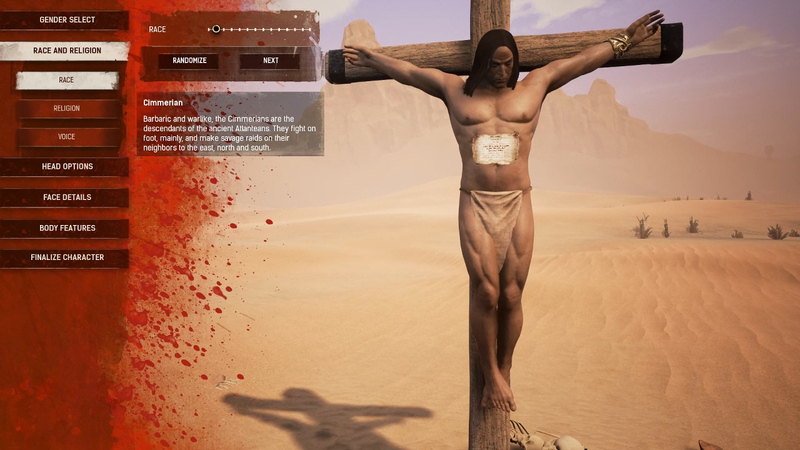 Using the character customization in Conan Exiles, we pay homage to Schwarzenegger's Conan The Barbarian. 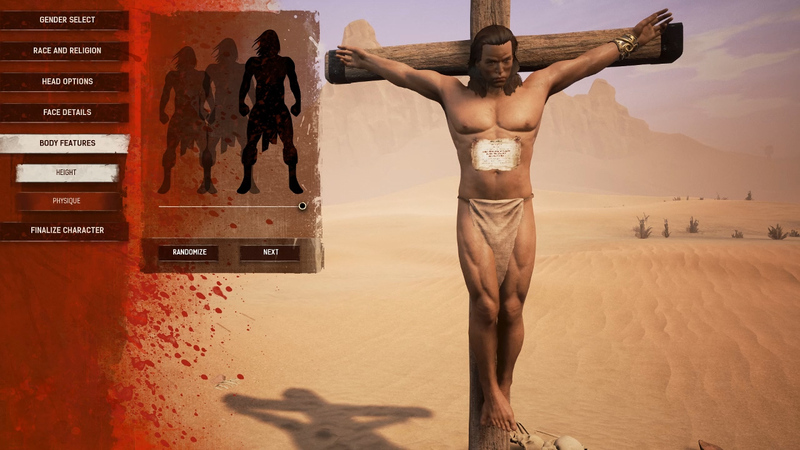 Conan Exiles is an Early Access indie game based off the Conan The Barbarian franchise, and since we’ve been playing quite a bit of this game, we decided to use its character customization mechanic to recreate Arnold Schwarzenegger’s famous portrayal of the barbarian. Almost immediately, you’ll be asked to choose your character’s race and religion. While these options seem like they won’t make too much of a difference to fans of the popular fantasy franchise, a little bit of Conan trivia goes a long way. It’s a well-known fact that Conan was a Cimmerian who worshiped a god by the name of Crom. Once the cultural aspects of our hero are out of the way, we can then move on to the more superficial features. By using a picture of Arnold as Conan for reference, we began by selecting the basics including face structure, hair, and eyebrows. Everyone knows Conan for his shoulder-length, dark brown, wavy hair. Match these with his eyebrows, which are thick, but not overbearingly so. From here, we went on to refine the details of our character’s face. We were inspired by young Schwarzenegger's very prominent facial features such as his chiseled jaw, high cheekbones, low-sitting eyebrows, pouty lips, and sloped nose. After messing with these options for a bit, we decided on a different face selection which made all the difference. Last but certainly not least was the body. The only options we really had here was height and chest size. It looks like the developers will be adding more to this in the future, but until that time comes, we just maxed out the options here because, well... Conan’s a beefcake, and to make him anything less than super swole would just be inaccurate. 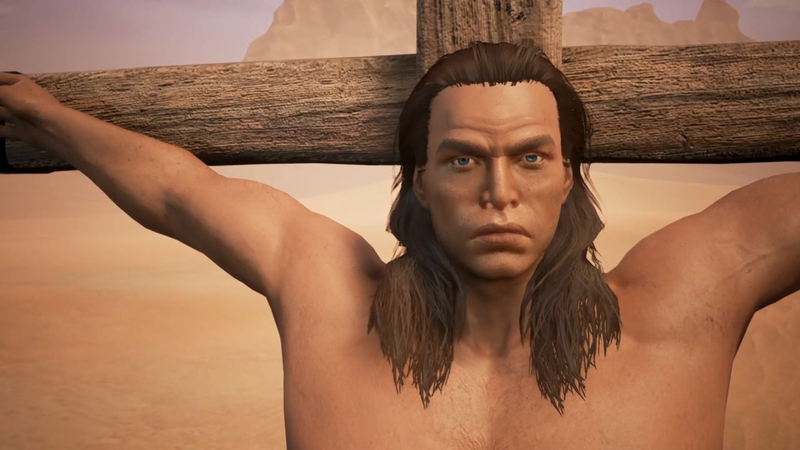 Check out our video below to watch us recreate Arnold Schwarzenegger as Conan the Barbarian in Conan Exiles. Don't be afraid to link us to some of your own Conan Exile character creations and let us know, what's your favorite Conan The Barbarian movie?